Soak green gram/ cherupayar in water and pressure cook it adding enough water and salt and keep it aside. Crush grated coconut, turmeric powder, shallots, garlic clove and green chillies together. Add curry leaves, grated papaya and salt and mix well and cook covered in low flame for 4-5 minutes, stirring occasionally. 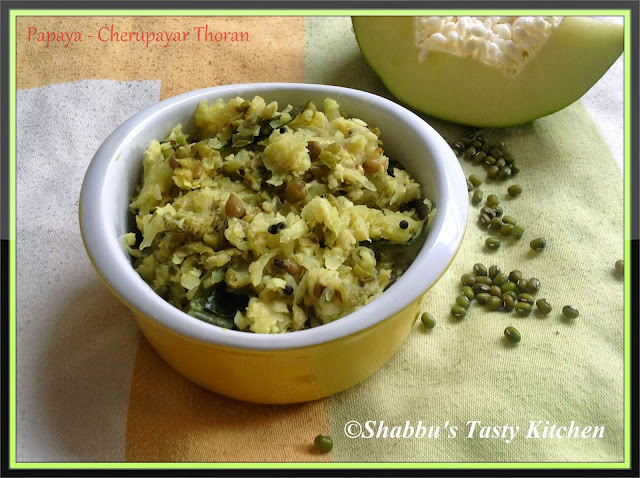 Then add cooked cherupayar and crushed coconut mixture, mix well and cook for 2-3 minutes.